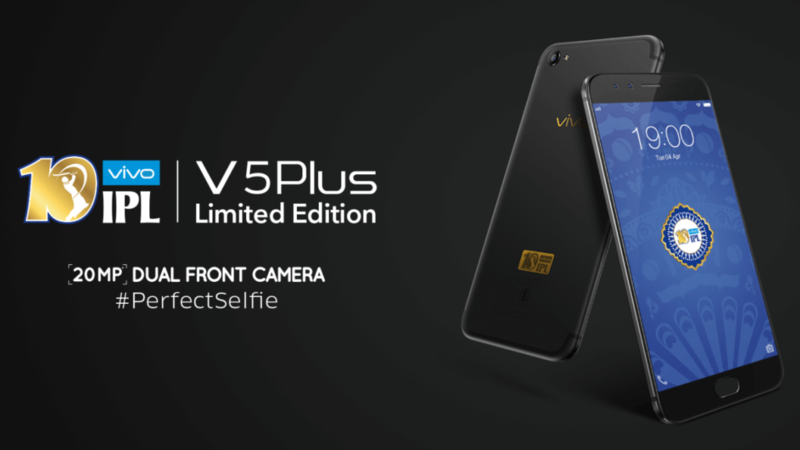 Chinese smartphone manufacturer VIVO recently relaunched their flagship smartphone VIVO V5 Plus IPL Limited Edition on April 4th, Just one day before the 10th Edition of Indian Premier League. Today, It has gone on sale in India via Flipkart as well as some retail and exclusive VIVO Stores at Price Rs. 25,990. We all know that the Standard model of VIVO V5 Plus IPL Limited Edition was launched two months ago and was priced at RS. 27,980. So, what’s the difference between the standard model and the Limited Edition model? Well, The smartphone has no major difference in specifications when compared to the Standard model. The only major difference is It comes in a new premium matte black color and sports a gold colored IPL logo at the back. The VIVO V5 Plus IPL Limited Edition features a 5.5-inch full HD (1080p) display with Corning Gorilla Glass 5 protection. In the core, it is packed up with a 2.0GHz Snapdragon 625 octa-core processor. It is equipped with 4GB of Ram and 64GB Internal Storage which is non-expandable. On top of these core features, It offers dual sim 4G LTE, Wi-Fi 802.11, Bluetooth 4.0, and GPS connectivity options. It measures 152.8×74.00×7.26 mm and weighs 158.6 grams. VIVO V5 Plus comes with 3055mAh battery which is Ok.
Now let’s highlight the camera features. The biggest takeaway is its dual front camera setup. It sports a 16 Megapixel primary camera with LED Flash, On another hand, it sports a dual selfie camera setup which has a 20-megapixel camera with the Sony IMX376 1/2.78-inch sensor, a f/2.0 aperture, and a 5P lens system and an 8-megapixel camera that’s meant to capture depth-of-field information. It supports full HD Video recording but the bad part hung up with the non-expandable storage. The phone is powered up with Vivo’s Funtouch OS 3.0, based on Android 6.0 Marshmallow. So you could have understood that camera is the only tempting thing about this phone. Well at the last we have some tips for you when you look at the Vivo V5 Plus IPL Edition you end up with a question, have I seen this phone before? Yes, it is when we look at the back It’s just same as iPhone 7 except the branding of IPL logo. Considering the price this phone has not more to offer except the good camera. This is what we have got so far for Vivo V5 Plus IPL Edition. Stay tuned to our blog for more updates. Keep following our blog World Top Updates for more information.